Ruby Tuesday (Yes, Ruby Tuesday still exists). Though the signage posted on the space indicates the restaurant will open in the summer, I'm told the restaurant is targeting a September 1st opening. When the Mall of Georgia opened in 1999, Chow Baby's planned new space was a Mt. Pleasant, South Carolina-based Wild Wing Cafe. Shortly after Atlanta-based Taco Mac opened in a mall outparcel, Wild Wing closed. Later, a local Mexican restaurant opened in its place, which in turn gave way to the beloved but mismanaged Crescent Moon. Crescent Moon, a favorite of downtown Decatur for years, expanded to Northlake Mall in Tucker and later Mall of Georgia, but after being mismanaged and the food quality suffering, all locations were shuttered. The Kneaded Perk Bakery opened in its place, but having relocated from a much smaller location, was soon unable to afford the rent on the larger space. The Real Chow Baby currently has locations on Howell Mill on the westside and on Ponce de Leon Avenue in midtown. Big Chow Grill at the Galleria near Cumberland opened as The Real Chow Baby but through a serious of sales and partnership splits, is now known as Big Chow Grill although it offers essentially an identical menu. Both restaurants feature create your own stir fry options and both are economically priced with buffet style menus. The new Chow Baby's size will be on par with the Howell Mill location. Dallas, Texas-based Genghis Grill, another stir fry concept, entered the Atlanta market in 2010 with a location on Mall of Georgia Boulevard near Moe's Southwest Grill just off I-85. Genghis Grill added an additional location in Peachtree Hills in a former Blockbuster Video space and later another in Dunwoody in the R.E.I / Goodwill anchored center at Mt. Vernon Highway. Other locations were planned for Alpharetta, Camp Creek, Athens and Marietta but expansion has come to an abrupt halt in the Atlanta market. This past February the Peachtree Hills location closed after less than year in business, and was immediately replaced by Miami-based Lime Fresh Mexican Grill. Sources say both the Buford and Dunwoody locations do fairly well at lunch but are completely dead during dinner hours most days. Chow Baby will definitely have a better chance at survival given they are in the mall, and are a local company with existing brand recognition. Given they are located on the second level of the mall, hopefully they won't be foolish like they were on Ponce in offering exclusively valet parking. What do you think of this latest restaurant addition at Mall of Georgia? What is your favorite Mall of Georgia area eatery? Do you think Chow Baby will put Genghis Grill out of business? Please share your thoughts in the comment section below. If my memory is correct, It was a Buffalo's Cafe at the mall, not a Wild Wing Cafe... I remember the big Buffalo head that blew smoke when you entered from the mall entrance. I am sooooo excited. I LOVE CHOW BABY. I have been to both concepts. Although Chow Baby has a "sexier" atmosphere than its competitor, Genghis Grill wins in terms of variety of food selection, food quality, taste, and service. I have been to both places. Although Chow Baby has a more "sexier" atmosphere than its competitor, Genghis Grill wins in terms of variety of ingredients, food quality, and service. Im so ready for this. dont have to drive all the way to Atlanta. Yeeaaa!! 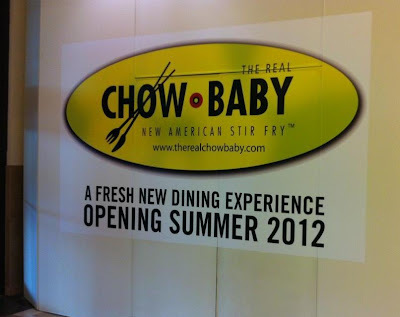 I can't wait for Chow Baby to open. They will be an immediate success! There is no comparison in Chow Baby and Genghis and their days are numbered. Couldn't be more excited about this, I go by almost daily to see if it is open. I like this way more then genghis. Love the healthier selections. I think it is a fabulous location! I also tried the Genghis Grill location and found too vegetables mixed together to suit all, but liked the assortment of spices better than Chow's. We will not eat at Genghis again, but think current patrons of Genghis may prefer Genghis if they have made it one of their "go to" places. We want to eat The Real Chow, Baby. I work at Ruby Tuesday and TRCB has been closed for a week... any word on that?